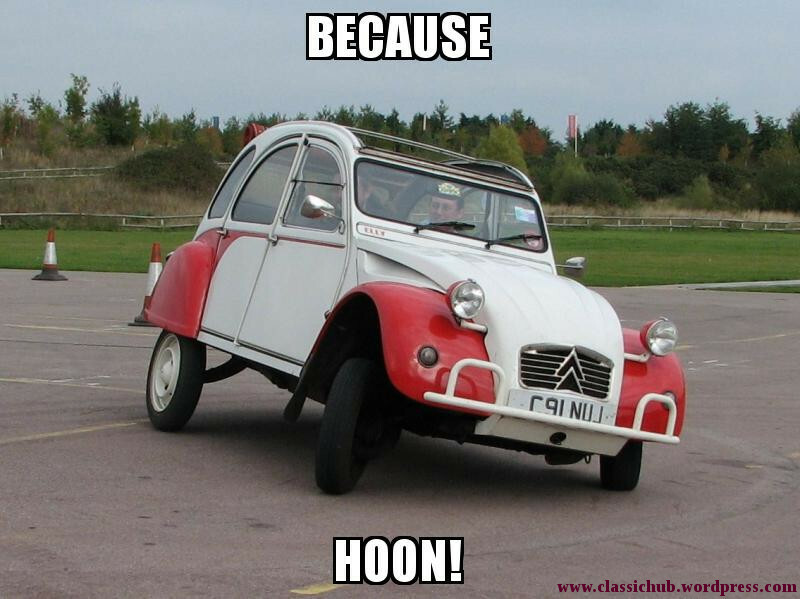 Because Hoon! – HubNut – celebrating the average! I’ve set this image free into the internet today, as a celebration of just how much fun the 2CV is to drive. Well, it sums up the car nicely! People who’ve never so much as sat in a 2CV can be very quick to pour scorn upon this French peasant’s wagon, but those of us who understand know that it’s hard to have more fun on four wheels without the aid of an energetic partner. Even after 18 years of 2CV ownership, it amazes me just how much fun you can have chucking a 2CV down a twisty road. The above photo was taken during a rally experience at the Heritage Motor Centre. We demonstrated just how much fun a 2CV could be on an Autotest course, and then chased a Ford Cortina Mk1 down the country lanes as we had a go at reading a Tulip-style route book. Elly the 2CV is currently two days away from an MOT test. Yes, she needs lots of restoration in the next year, but I’m hoping she’s solid in all the areas an MOT man cares about. My fingers are crossed. Wish me luck! Have any of your classics got an MOT looming?